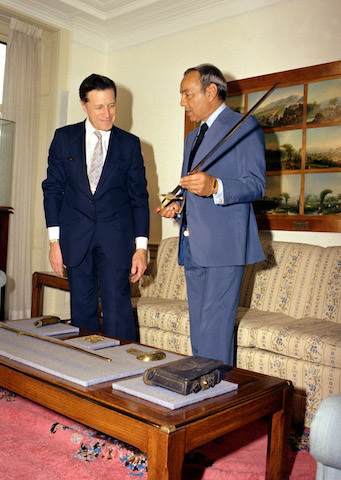 A recently discovered letter, dated September 1986, from Secretary of Defense Casper Weinberger to King Hassan II, revealed an end to a two-year split between the United States and Morocco over a Libya-Morocco detente, and underscored the importance of reestablishing our close and respectful bilateral relationship during the presidency of Ronald Reagan. In a controversial disinformation operation launched by the United States against Libya in the early 1980’s, President Reagan ordered a campaign to isolate and destroy Libyan President Ghaddafi and Libya’s ability to continue what it viewed as terrorist activities, and expected that Morocco would play an important part in that effort. So, one can imagine why the United States was “startled” when, on August 14, 1984, in the middle of its campaign to destroy Ghaddafi, King Hassan and the Libyan President signed the Arab African Federation Treaty, with the aim of creating a “Great Arab Maghreb”. At the time, the Reagan Administration viewed Morocco as a “bulwark against Libyan subversion and expansionism in Africa,” and therefore saw this as unhelpful, lending legitimacy to Ghaddafi, and potentially setting back the US-Morocco relationship. For the Reagan Administration, Ghaddafi’s terrorist actions reached their height when he ordered the bombing of a West Berlin discotheque in 1986. In retaliation, the US, in an operation code-named Operation El Dorado Canyon, bombed Libya in April of that year. In August of that same year, recognizing that Ghaddafi had become an international pariah, King Hassan ended the Libyan relationship and eliminated a problem that had caused much consternation to the US. This action by the King was of no small consequence to the US, given its foreign policy priorities at the time. King Hassan’s decision did not come without it costs, as Ghaddafi would attempt to have him killed in 1987. However, from 1986 forward, the US- Moroccan relationship would only continue to grow stronger, through the GHW Bush, Clinton, and W. Bush administrations.